Hey dollface, if you want to have the most exquisite flapper costume this Halloween then you are going to have to make sure that you have the fanciest accessories to compliment your outfit! Be sure to have an extravagant headband with the tallest feather you can find to accentuate your gracefulness. Have plenty of rings on your fingers and bracelets up and down your forearms so you shine brighter than the night sky. Also, throw on a stylish pair of shoes so you can tango the night away. Wow, your costume sounds nearly complete! All you need now is a finishing touch and we have just the thing for you. 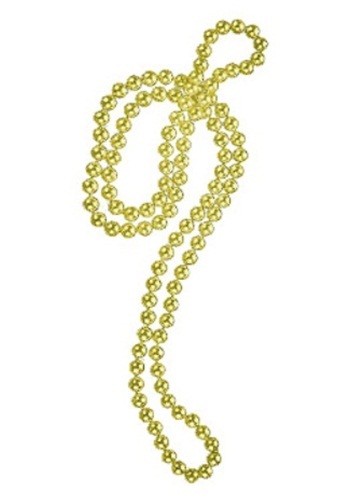 Take a look at this Golden Beaded Necklace! Sure, a pearl necklace is one way to spice up an outfit but gold is just so much better! It's the bee's knees, the cat's meow, the chicken's gizzard! Maybe that last one's not an expression but you get the point! This gold necklace is the perfect jewelry to add to your flapper costume! You'll be the classiest gal on the dance floor! Bring the Roaring Twenties back to life this Halloween when you add this beaded necklace to your costume!